Seeing as the CE is in need of more useful programs, I decided to make an (at least for now) simple text editor for it. 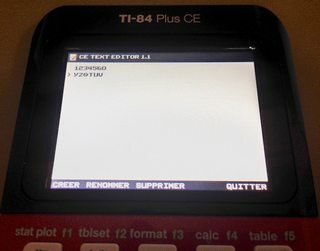 You can create, edit, rename, and delete notes with the variable-width font, and even import notes from your computer and then edit them on-calc. Thought this might be helpful to some. Also, the way I set things up makes it easy to add new functions, so if you would like anything more, please post and I will consider implementing it. For now, give it a try, and please report any bugs or errors that you may find! Thanks all! Also, things like text wrapping are next on my to-do list. Edit: I ran the converter with Wine, FWIW. I've noticed that if I run the converter program from within the same folder, the generated .8xv is valid. Ah, I forgot to account for that. So if the program is located in directory A, and you are converting the file in directory B, it fails? Sure, I can fix that right up. I suppose you only support ASCII for now, though. Hm, I wrote it to support the full extended ASCII table, but I guess for some reason the converter doesn't like accents. Will look into it, and add support for inserting accented symbols. [2nd][arrows] for moving the cursor around quickly, not one char. by one char. Not sure about that, but: attributes on the file (especially in the file browser), for instance if you're able to grab the date/time from the OS and assign it to the last modified date, that'd be nice. Are you familiar with the dynamic programming solution to word-wrap? Also, how do you handle inserting characters at earlier points in the edit buffer? Nope, but sounds like a good thing to look into. The buffer is a fixed size (But the text itself is only displayed until it reaches a NULL byte), and it copies from (BufferSize-InsertAmount) to (BufferSize) backwards until it reaches the cursor location. It's basically just a little LDDR routine. Definitely It has something like O(n^2) runtime, but looks a *lot* better than the greedy approach, and you only need to re-run it from the line where you're editing (similar to insert), so it's at least worth trying out. When I make a new text document using the program without having first edited another document, it does not allow me to switch to Alpha mode and name it with letters (except for the capital X). Instead, I have to just kind of name it and then edit it and then rename it to what I want it to be. Progress: Basically done, but I want it to check for keypresses more often. About 320 times more often. Don't know how that's going to work out. Fixed and updated, I believe. Other things will be implemented later, once I finish a couple other items on the agenda. There is also no way (AFAIK) to type things like an exclamation point or special symbols. Other than those few suggestions, this is SUPER cool! I'd love to change the world, but they haven't released the source code yet. That is a side effect of me using the system routines for input. Easily fixable, but not high on my to-do list. May I suggest a *slightly* alternate input method? Maybe [Alpha] switches between normal input (numbers and symbols) and letter input, and then [2nd] acts as a sort of shift key. So both [2nd] and [Alpha] could be active at once. I really like this idea! Most of the time you will be typing in lowercase, so it would make sense to only change to upper if you are starting a sentence or something. Thanks! There is also no way (AFAIK) to type things like an exclamation point or special symbols. Yep, that's also on my to-do list, is to implement a table with selectable characters and add an exclamation point somewhere. Also, for future reference, please try not to post within 24 hours of yourself. It is just one of those forum rules here. Thanks! Basically, I think that scrolling up and down should be based on the cursor position in pixels, not characters. I can only create new documents. I would like to upload documents from my computer. Any help on this? Step 4) Send files to calculator that were produced in 'Converted Files' directory. 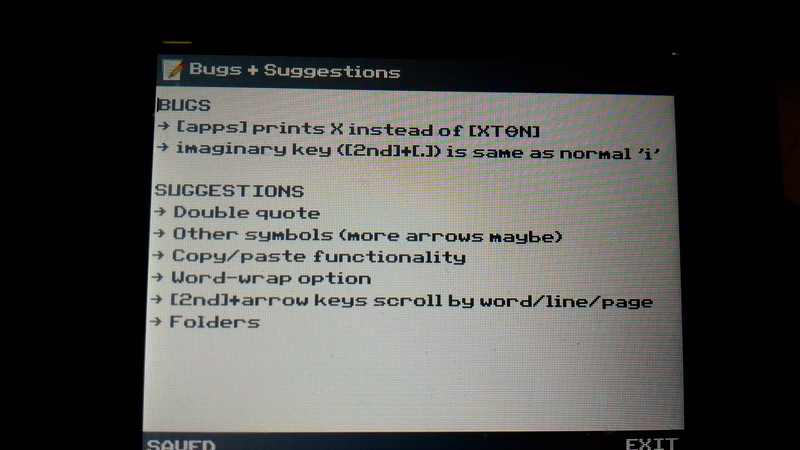 Thanks, but I've tried that and the files still do not show up when I open the program. I can only create a new file. 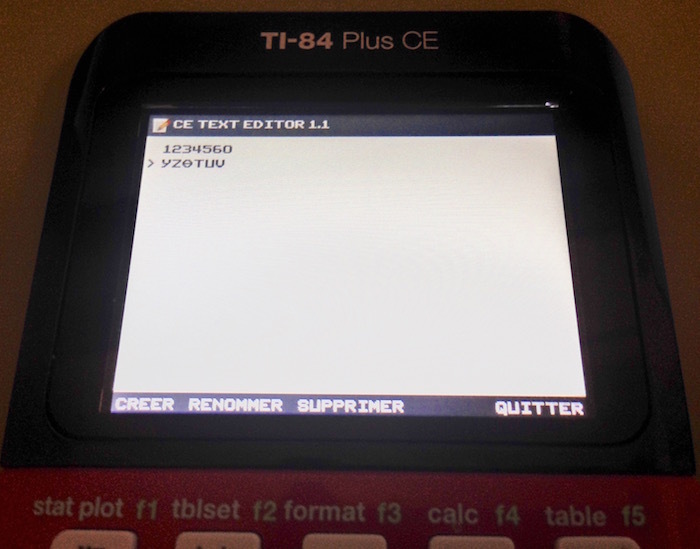 How are you sending files to the calculator? I am just dragging and dropping saving to the archive. There are 234 users online: 11 members and 223 guests. Members: bdoggamer, commandblockguy, GravestoneGamesYT, GregsAStar, LogicalJoe, TimmyTurner62. © Copyright 2000-2019 Cemetech & Christopher Mitchell :: Page Execution Time: 0.264889 seconds.